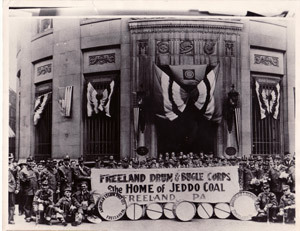 This photograph of the Freeland Drum & Bugle Corps comes to us through the courtesy of the Greater Hazleton Historical Society, where I scanned it in 2010. 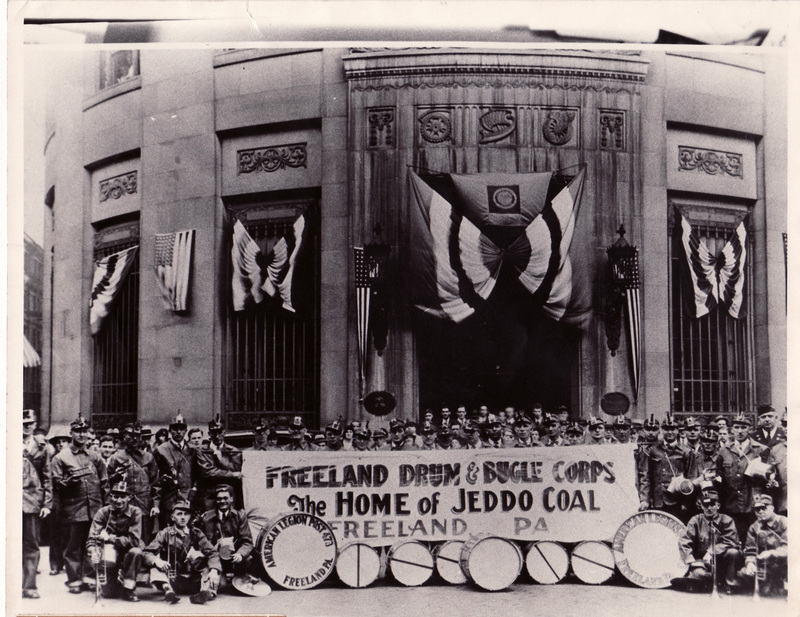 The banner reads: "Freeland Drum & Bugle Corps, The Home of Jeddo Coal, Freeland, Pa." The drum reads: "American Legion Post 473, Freeland Pa." I don't know where the photo was taken, but for anyone who was there or who has photos from the event in their family photo collection, the site will be instantly recognizable. If you do know the location, please let me know and I'll post the information here. 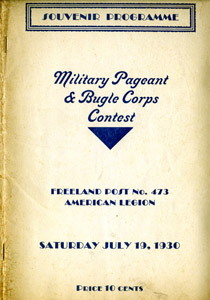 Charlie Gallagher provided the souvenir program booklet shown in the upper left corner of this page from a 1930 Military Pageant & Bugle Corps Contest, sponsored by Freeland Post No. 473 of the American Legion. 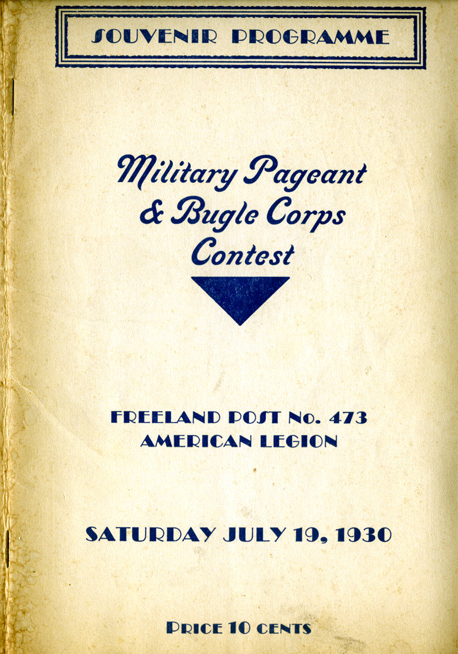 It includes a short history of the American Legion post and the Drum and Bugle Corps that begins: "Freeland Post No. 473, American Legion, was organized in September 1920, from a small group of Service Men who had faithfully served the United States in a military and naval capacity during the World War. Only those who had served during the period between April 6, 1917, and November 11, 1918, being eligible for membership and only on presenting their honorable discharge." Please feel free to download this PDF of the booklet and enjoy it. It not only contains the information about the contest, but there are many business ads from local businesses who helped to sponsor the event.